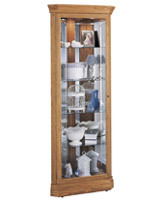 This Display Cabinet Comes with Lights and a Locking Glass Door! 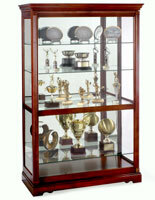 This Display Cabinet Is a Curio Cabinet with Pad-Lock Glass Shelving to Display Trophies! 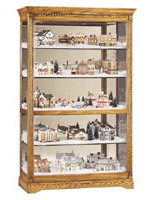 This Display Case Is Stocked by the Thousands in Our Warehouse! 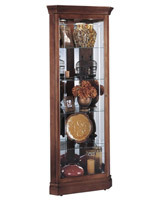 A No-Reach™ Touch-Lite™ located on the corner cabinet back to provide easy access to lighting. 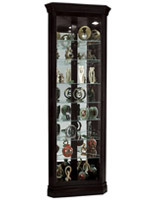 A locking glass door to provide easy access to, as well as security of, your collectibles. 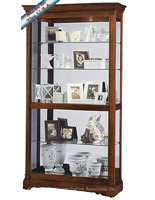 Crystal-cut grooved glass adds elegance. 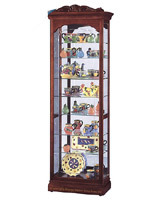 Fully adjustable glass shelving with Pad-Lock™ cushioned metal shelf clips add stability. 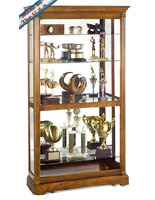 This display cabinet incorporates a swan-neck pediment with elegantly engineered rosettes and a keystone center. A Windsor Cherry finish adds even more elegance to the piece.